Martin Slevin scored twice from the spot for Racing Club on Tuesday evening. Racing Club translated their recent fine away form into home points on Tuesday to end second-placed lkeston Town’s nine-match winning run. With Martin Hutchcox joining fellow central defenders Joe Smith and Jamie Coleman on the injured list, Paul Holland started at the back alongside Rich Powell who was then forced to be replaced by Henry Leaver in the first half. Despite the makeshift central defensive partnership, Racers started well and took the lead in the fifth minute when Luke Cole slotted home superbly after a run and cross from Trea Bertie. Ilkeston missed a gilt-edged chance to equalise when Tim Hopkinson fired horribly wide at the back post after being picked out by Lavelle White. However, against the run of the play, the Robins were level in the 15th minute. Hopkinson beat Tom Cross to a long through ball and pulled it back for Jamie Walker whose shot was deflected inside the post. Sean Kavanagh shot wide for the hosts after bursting through before Ilkeston took the lead, Alex Marshall robbing Holland before slotting past Cross. With the first half coming to a close, Warwick were handed a way back when Ilkeston keeper Ian Deakin fouled Kavanagh in the area. Deakin limped off to be replaced by substitute keeper Jamie Hannis who was well beaten by Martin Slevin’s spot-kick. 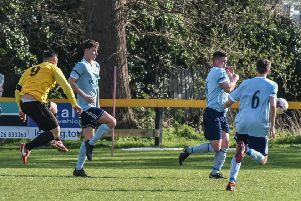 The hosts began the second half on the front foot and Bertie had an effort blocked by Charlie Jemson before Billy Bennett’s interception denied the forward what would have been a tap-in. Racers were well on top but it needed a fine save from Cross to prevent them falling behind after a free-kick deflected off Marc Passey. Bertie then made it 3-2, picking up the ball on the right and firing across Hannis and into the bottom corner. Lewis Hudson was inches away from converting a Kavanagh cross and as Racing Club grew in confidence they put the game out of Ilkeston’s reach in the 75th minute. Bertie was brought down by Hannis and Slevin again stepped up to send Hannis the wrong way. It left Racers boss Scott Easterlow to reflect on what might have been had his side not had to contend with a gruelling schedule. “It was one of those nights when I looked at our lads and thought that if it wasn’t for the fixture backlog, how much higher could we be in the league? “I honestly believe come the end of season the placings won’t be a true reflection of where we should be but it’s happened now and we have to deal with it. “Last night we turned up against a very good side who have a wealth of top players on loan from higher non-league clubs and lads on loan from Notts County, who their chairman also owns, and we turned in a very good performance which is the perfect start to a hectic week against all the top sides.